10 Festive Halloween Attractions & Activities - Top Ten Travel Blog | Our experiences traveling throughout the US. It’s that time of the year again when we can finally pack away the shorts & flip flops, turn off the air conditioning and feel the cool breeze coming in through the windows, and enjoy all types of pumpkin treats and festive fall attractions. With an abundance of seasonal fun including pumpkin spice lattes, fall color hikes, pumpkin patches and farmer’s markets, Halloween attractions, and more, this time of the year offers an endless supply of fun for the fall lovers out there. The amazing Halloween festival at the Roger Williams Park Zoo in Providence, Rhode Island. 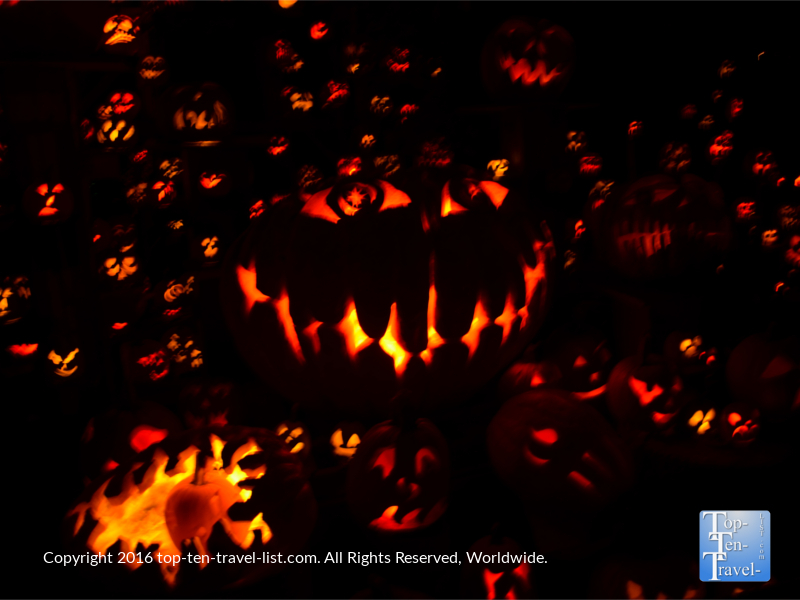 This annual celebrations, known as the Jack O’Lantern Spectacular, features over 5000 pumpkin carvings! Halloween is just around the corner and there is spooky fun to be had just about everywhere. No matter where you live, you can find fun fall and Halloween activities near you. Check out these 10 fun and festive Halloween events & activities to get yourself into the Halloween spirit. 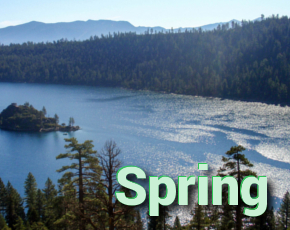 A fall getaway to any of these areas will provide you with more than enough Halloween fun. Check out the incredible detail on this carving! A beautiful lighthouse and lobster representing Maine. The Roger Williams Park Zoo is home to one of the most festive & elaborate Halloween celebrations in the country. 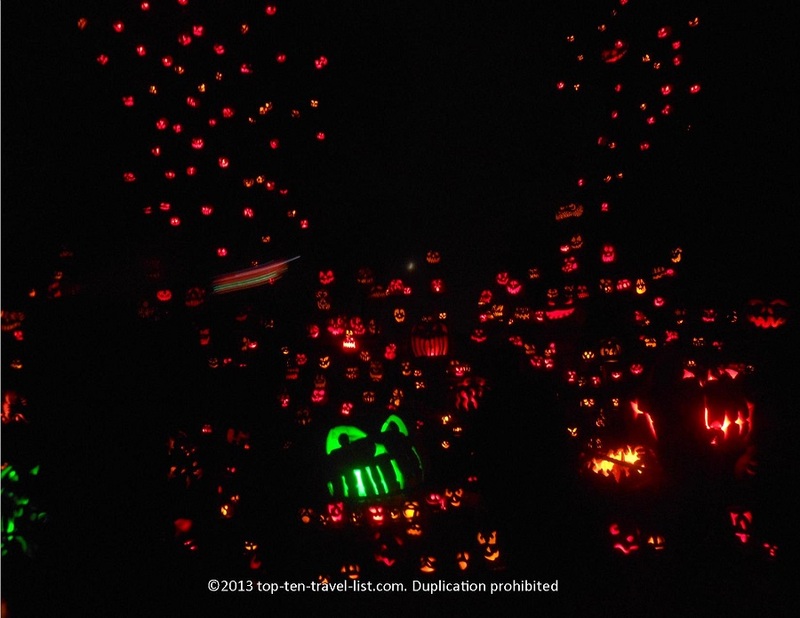 Each October, over 5000 Jack O’Lanterns illuminate the grounds of New England’s top zoo. More than 100 artistic creations are incorporated into a special theme each year. The elaborate detail put into each pumpkin is simply astonishing. It takes 15-20 hours for an artist to create each one! And, as we all know, carved pumpkins go bad quickly, and thus, Jack O’Lanterns must be replaced each week! The zoo does a terrific job organizing the pumpkin display and the entire setup is just gorgeous with glowing Jack O’Lanterns everywhere, even up in the trees. The best part of all is that the theme changes every year so you can come back again and again to view these artistic masterpieces. For 2016, the theme is “American Treasures,” a celebrate of our nation’s history through commemorative postage stamps. More Halloween fun in the Providence area: The Providence Ghost tours at Prospect Terrace Park, Factory of Terror in West Warwick, Scary acres haunted hayride in Cranston, and so much more. I also recommend trying out a great pumpkin dish like the delicious Pumpkin Ravioli at Pizzico, located in downtown Providence. 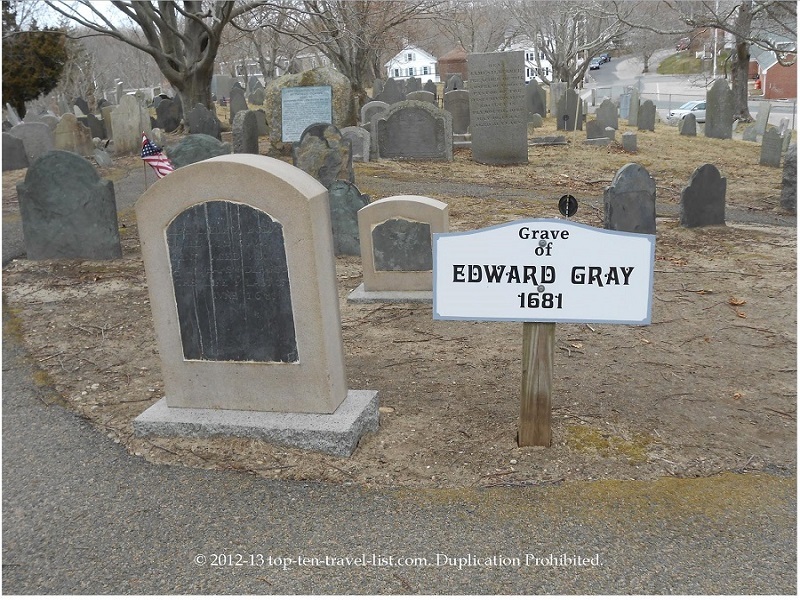 The haunted ghosts tours in Plymouth are not your ordinary ghost tours. Although many areas of the country offer these spooky tours as soon as October rolls around, few have the creepiness factor & haunted history of this Plymouth tour. For starters, this walking tour takes you through one of the country’s oldest & most haunted cemeteries: Burial Hill where the oldest gravestone dates back to 1681! Additionally, as one of the country’s oldest cities, Plymouth has a long history of paranormal sightings and you will hear about many of them during the course of your tour. The tour guides are lively and personable and more than willing to share their personal ghost stories. This tour does not feel like one out to just to take your money, rather the staff seem really passionate about what they do, the Plymouth area, and Halloween & ghosts in general. It’s by far the best ghost tour I’ve ever taken. Hearing stories of numerous local’s ghost sightings will truly make you question whether or not ghosts really exist! If you once doubted the presence of ghosts, you might reconsider your stance after taking this tour! On this ghost tour, you will get to test out real ghost hunting equipment such as EMF meters – these just happened to go off like crazy in the cemetery during my tour! Throw in fall foliage, chilly fall weather, creepy historical architecture, and you have one spooky tour that offers the perfect ambiance for Halloween! 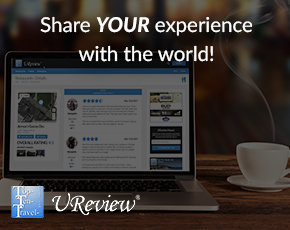 Be sure to check Groupon for special discounts! 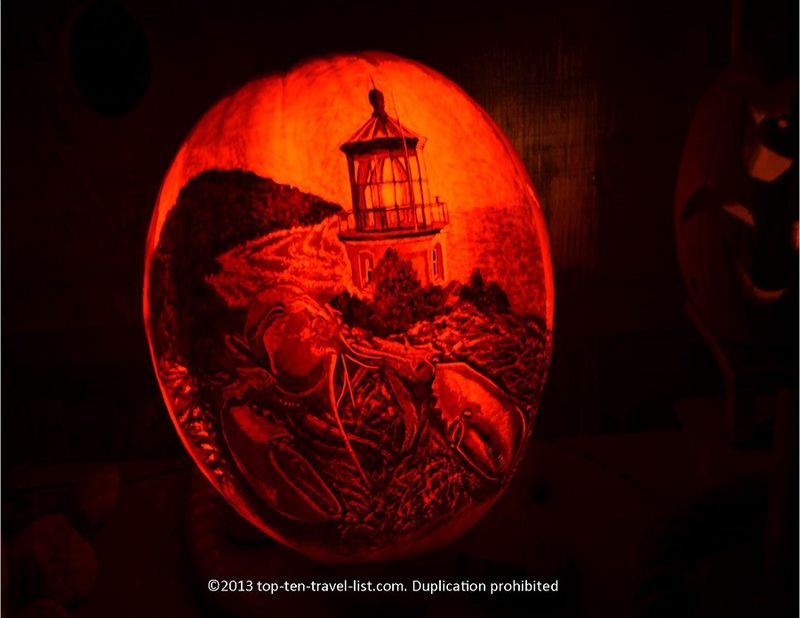 More Halloween fun in the Plymouth area: Halloween on Main Street (a free event held each year on Halloween night, with an abundance of festive free seasonal activities to enjoy), lots of festive Halloween parties, Sauchuk’s Corn Maze & Pumpkin Patch in Plympton, Ghost tours at Town Hall, and much more. I also highly recommend a fall hike at beautiful Myles Standish State Forest – the colors are amazing this time of year! 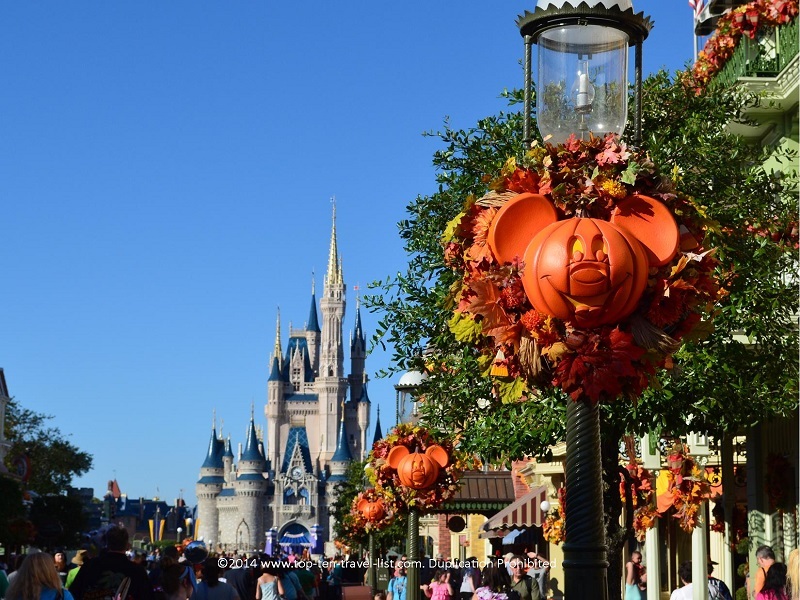 Halloween and theme park fanatics will be absolutely delighted with Disney World’s super festive annual Halloween celebration, which runs from the beginning of September through Halloween. This is the most festive and fun time to visit the park for Halloween lovers, as well as the perfect time for anyone wanting to enjoy the park at night with the advantage of less crowds, shorter ride wait times, and slightly cooler temperatures. This festive celebration, known as Mickey’s Not So Scary Halloween Party, requires a special ticket purchase which will admit you into the park after regular closing. The level of Halloween related fun is hard to top here. One would think Halloween in Orlando does not sound like the ideal place, however, so much effort is put into this celebration, you won’t even care about the lack of foliage and unusually warm fall climate. From the moment you walk in, it’s all Halloween. Main Street USA is decorated gorgeously with all sorts of fall decor and 100’s of glowing Jack o’lanterns. Additional Halloween activities including Trick R’ Treating stations throughout the park (yes adults can trick or treat too! ), a haunted stage show, an incredible Halloween themed fireworks show at the castle, a special Halloween parade with a headless horsemen, special fall pumpkin treats, Halloween music, and so much more! Rides like Pirates and The Haunted Mansion are even more fun this time of the year. There is a ghost lady entertaining guests in front of The Haunted Mansion as well as many other costumed characters including your favorite villains from both new & classic Disney films. Best of all, the wait times for the rides are virtually non existent as there are far less crowds at this special event in comparison to regular daytime hours. In addition, most of the guests are spread throughout the theme park enjoying the various Halloween festivities, and thus, traffic is not centered just around the rides. More Halloween fun in the Orlando area: Halloween Horror Nights at Universal Studios, Zoo Boo Bash at the Orlando Zoo, and the Pumpkin Harvest at Green Meadows farm.